The ALL NEW Jump2IT GameMat ($100)turns a trampoline into an important math learning tool that Multiplies the fun in your backyard! 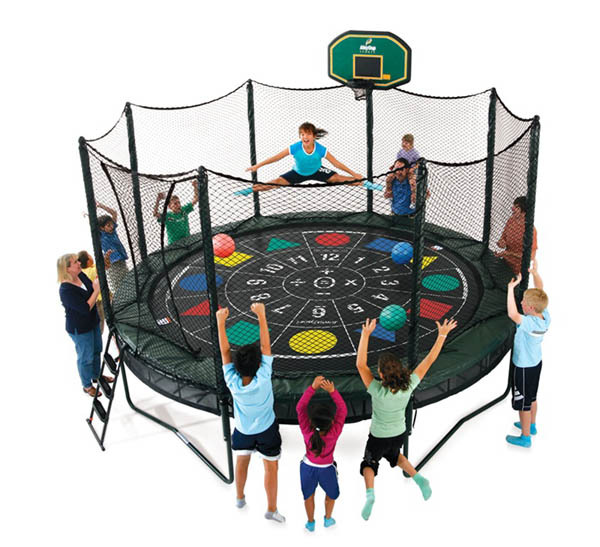 With the Jump2IT GameMat�s clock face, colorful shapes, numbers, and math symbols, the trampoline is transformed into a GIANT educational game board. ProFlex Basketball ($159)Option Attaches securely to your AlleyOop Safety Enclosure Includes Backboard, cushioned hoop with Heavy-duty ProFlex hardware, and 7" inflatable basketball. Sure Step Ladders($59).Sturdy design with large, flat, platform steps for added safety. Non-permanent installation so ladder can be easily removed to limit access to trampoline. Powder Coated and UV treated for lasting weather protection.